The land on which Carter Mountain Orchard sits is rich in Virginia history. According to research done at the Albemarle County Historical Society, The Honorable John Carter, Esquire obtained by grant 9350 acres of land, which embraced the whole of what is still called Carter Mountain, in 1729. Carter was at one point the Secretary of the Colony of Virginia. Upon his death in 1742, his land was given to his son Edward. Edward represented Albemarle County in the House of Burgesses from 1767 to 1769, and in the House of Delegates from 1788 to 1792. In 1771, in exchange for legal services for Edward Carter, Thomas Jefferson was to receive “as much of his (Carter’s) mountain as can be seen from mine, and 100 yards beyond the lines of sight agreed before Captain Burton” (documented in the papers of Thomas Jefferson). This land is owned by Monticello and is adjacent to Carter Mountain Orchard. The land on which our orchard sits changed hands several times in the past 200 years. 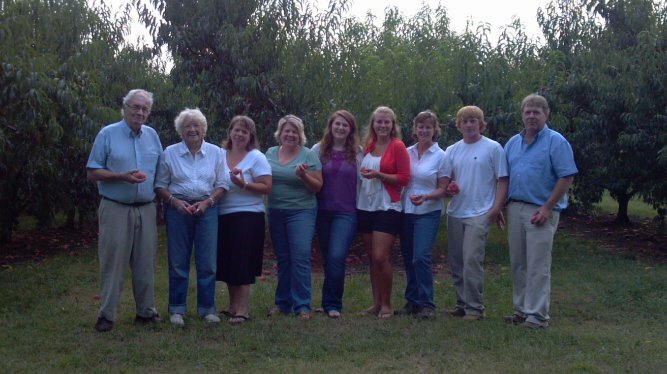 In the early 1970’s the Chiles family of Crown Orchard began operating Carter Mountain Orchard, and purchased the land in 1985. The apples were grown for commercial production, and were packed and shipped all over the country. In 1974, we had an almost total freeze-out in our orchards. There was not enough fruit to hire a picking crew or run our packing house. So, we decided to open up the orchard to the public and let them pick what few apples we had. We put an ad in the local newspaper, cleaned out a tiny section of an old barn, set up a card table and a cigar box, and wondered if anyone would come (the idea of “pick your own” was a fairly new concept at the time). Fortunately for us, the public did indeed come. We sold all the apples we had that year, and called it a success. While we intended to just be open that one year for Pick Your Own, we were quite surprised when the phones began ringing the following fall with folks ready to come back to pick! Since the public had been so good to us the previous year, we felt we could not say “no”, so we set aside a few acres of apples, and were once again in the “Pick Your Own” business. We put a pot-bellied stove in the barn (it got real cold on some of those days! ), put out a sign, and Mrs. Chiles and one other employee worked seven days a week for 2 months to sell the apples. It was a hit! The public was getting a hunger for fresh fruit, straight off the farm. Our unique mountaintop location and spectacular view were, and continue to be, as popular as our apples! As the years passed, we slowly took over more and more of our barn, making room for our Country Store. We built restroom facilities, made a LOT of parking space, and entered the world of cash registers, credit cards, and internet marketing! We set aside more and more of our apple trees for Pick Your Own, as the demand quickly outpaced our supply. We invited school groups to our orchard for a unique hands-on learning experience – more than 8,000 students and teachers visit us annually on a field trip. In the 1990’s we planted some peaches to extend our season – this allowed us to have something to pick in both summer and fall. The addition of our bakery in 1995 was an instant success – and our apple cider donuts are still one of our best “attractions”! In 2008 we built an expanded kitchen facility to serve you those donuts faster! We also added a wine shop and tasting room (operated by Prince Michel Winery), so that you can purchase Carter Mountain wines, made from grapes grown right on our farm. In 2012, we were honored to become a Century Farm in Virginia – the Chiles family has been farming in Albemarle County for over 100 years! Our newest addition, in 2015, is the Bold Rock Cellar at Carter Mountain! You’ve been asking us for hard cider, and now you can sample, drink it while you are here, and take some home! These days, it takes lots of people to keep our farm running – and most days you will see 3 generations of the Chiles family, as well as our amazing staff, here to greet you, teach you about the fruits we grow, serve you a donut, and thank you for visiting our family farm.